These specially prepared Ore-Ida Crispy Crowns! (r) are coin shaped Tater Tots(r) potatoes that cook to crispy perfection using the heat from your microwave. 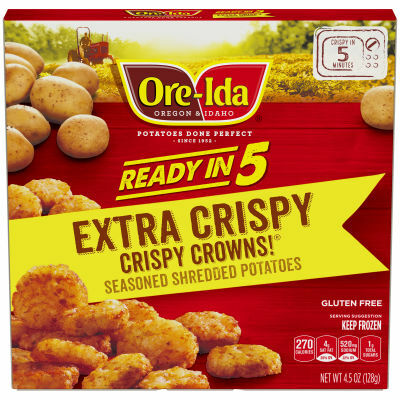 Now you can enjoy crispy and delicious Tater Tots(r) in less than 4 minutes with Ore-Ida(r) Easy Tater Tots(r)(em)Crispy Crowns! (r) ; Enjoy anytime! Breakfast, lunch, dinner or snack.